I toured Four World Trade Center two weeks back. It was raining but still pretty cool views of the area. And I got close to Larry Silverstein. Zurich North America, the U.S. subsidiary of the Switzerland-based insurance giant, is in negotiations to move its Manhattan office to the World Trade Center site, according to several sources familiar with the firm's plans. Zurich is seeking to take about 70,000 square feet at 4 World Trade Center, where the company will relocate from nearby 1 Liberty Plaza. According to the real estate database CoStar, Zurich occupies almost 170,000 square feet at 1 Liberty. Sources said the insurance firm plans to consolidate a portion of its current office into a smaller footprint at 4 World Trade Center and relocate the rest of its staff to New Jersey. The company is searching for space in Jersey City and has toured the waterfront office complex Harborside as a potential location, a source said. "Our lease at 1 Liberty Plaza expires in May 2017. As standard practice when the end of a lease approaches, we evaluate many factors including business needs and operating costs," said a spokesman for Zurich, in a statement. "Most importantly, however, we are committed to staying in the New York metro area to ensure that we are in close proximity to where many of our customers, brokers and employees are located." A spokesman at Silverstein Properties, which developed and owns 4 WTC, could not immediately be reached for comment. 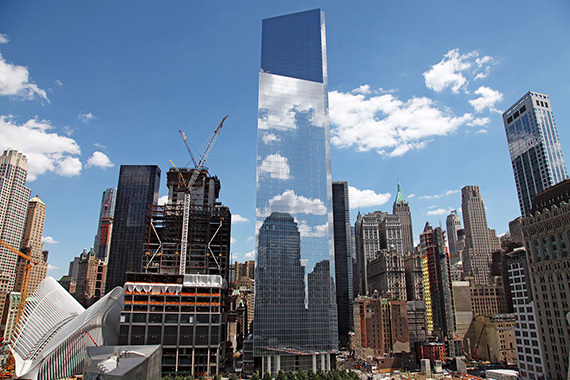 According to CoStar, 4 WTC is anchored by the Port Authority of New York and New Jersey, which moved its headquarters into about 650,000 square feet at the 2.3 million-square-foot office tower. The city also has about 600,000 square feet at the 72-story tower. Aside from large leases with government agencies, several private-sector companies have committed to space at 4 WTC. The software company MediaMath signed on for 106,000 square feet at 4 WTC nearly two years ago. 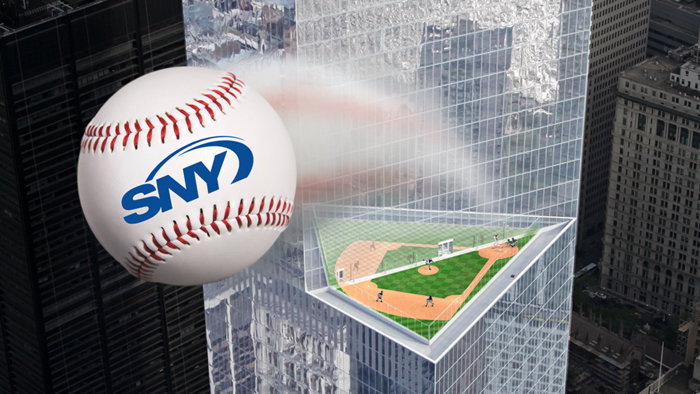 Last year, SNY, a cable sports network, took 83,000 square feet. The potential deal with Zurich is one of several leases rumored to be in negotiations at 4 WTC. Hudson River Trading, a high-frequency trading firm, is also said to have recently looked at relocating to the building from 32 Old Slip. It wasn't immediately clear if that deal will proceed. Silverstein Properties is in the process of building 3 World Trade Center, an office tower next door to 4 WTC that will be anchored by media company GroupM. Earlier this year, Silverstein's bid to begin construction on 2 World Trade Center, the last of the three towers the developer has the right to build at the World Trade Center site, fell through when News Corp. and 21st Century Fox backed out of a deal to anchor that building. © 2016 Crain Communications Inc.
High-frequency trading firm Hudson River Trading is taking 69,000 square feet of office space at Silverstein Properties 4 World Trade Center in the Financial District. The company will occupy the 57th and 58th floors at the 72-story, 2.3 million-square-foot office tower starting next year. Hudson River Trading’s space comes with a 5,000-square-foot outdoor terrace located on a setback on 4 WTC’s 57th floor and invisible from the street, according to the New York Post. The terms of the deal and asking rents at the building were not disclosed. The firm, which uses automated trading algorithms to carry out its high-frequency trading operations, will be leaving its current office at 32 Old Slip, also in the Financial District. Hudson River Trading will join the likes of software company MediaMath, which has 106,000 square feet at 4 World Trade Center, and sports cable network SNY, which occupies 83,000 square feet there. The Port Authority of New York and New Jersey anchors the property, which houses the agency’s 650,000-square-foot headquarters. Swiss insurance giant Zurich’s U.S. subsidiary is reportedly in negotiations to take around 70,000 square feet at 4 World Trade Center, as Crain’s reported earlier this month. Looks like 4 World Trade Center is the new hot spot(ify). Spotify has opted to move its headquarters to Silverstein Properties’ 4 World Trade Center, ending months of speculation on where it would relocate. The music streaming service will occupy 378,000 square feet at the top of the four-year-old, 72-story tower, Gov. Andrew Cuomo announced at a press conference this afternoon. As part of the deal with the State of New York, Spotify will get an $11 million rent reduction over the course of the company’s 15-year lease, according to Empire State Development Corporation President Howard Zemsky. A source familiar with the property said the asking rent was $85 per square foot. Cuomo announced that the agreement keeps more than 800 Spotify jobs in New York, and the company has committed to adding 1,000 new jobs. Spotify will move to 4 WTC next year, according to the governor’s office. Currently, Spotify is based at 620 Avenue of the Americas in Chelsea, which Gutierrez said was a great area but limited the opportunity to expand. Since last fall, rumors swirled as to whether Spotify would choose 4 WTC or 1 World Trade Center, which is owned by Durst Organization and the Port Authority of New York & New Jersey. The deal with Spotify also means that the entirety of 4 WTC is officially leased. Jeremy Moss of Silverstein Properties represented the landlord in-house, along with Mary Ann Tighe, Steven Siegel, Ken Meyerson, Evan Haskell, Adam Foster, Steve Eynon, Robert Hill and David Caperna of CBRE. Peter Riguardi, Ken Siegel, Alexander Chudnoff and James Wenk of JLL represented Spotify. A JLL spokesman did not immediately return a request for comment. The Swedish company had been eyeing both of the World Trade Center towers since last fall, as was widely reported. Spotify had been looking to expand beyond the 140,000 square feet it currently leases at RXR Realty’s 620 Avenue of the Americas between West 18th and West 19th Streets, as The New York Post reported in November 2016. Spotify’s deal is the largest that Silverstein has signed with a private corporation at the skyscraper. The Port Authority, which owns the ground at the World Trade Center, and the City of New York anchor the lower half of the 2.3-million-square-foot tower. In recent years, Silverstein has signed a mix of media and finance companies to the building as well, including New York Mets broadcaster SNY, food-focused public relations firm PadillaCRT and finance firm Hudson River Trading. With additional reporting provided by Liam La Guerre and Lauren Elkies Schram.